The Northern California Confined Space Competent Person course provides information for any person who may be called upon to execute any task that requires entering a permit confined space. The course covers OSHA Regulations, review of a permit entry program, emergency procedures, and demonstration of special equipment. In addition, the course will cover atmospheric hazards, monitoring and ventilation techniques, physical hazards, and self-contained breathing apparatus donning operations. Lastly, special hazards of rescue entry situations and rescue techniques will be addressed. This course is taught by highly trained, qualified instructors who have many years of hands-on field experience in emergency and non-emergency response. This course uses both classroom sessions and practical hands-on scenarios in the field to engage the student in the learning environment. A Written examination and practical manipulative tests are proctored to ensure that participants show proficiency in the instructional material presented. Certification of completion is provided to satisfy due diligence and regulatory requirements. The target audience for this course is all employees who may be called upon to execute an “Entry Rescue” into a Permit Entry Confined Space. This course is intended to provide information and practical skills for the student to competently and safely perform confined space entry and rescue practices in accordance with the Occupational Safety and Health Administration (OSHA) standards. It is designed for members of organizations who are expected to supervise or conduct work inside confined spaces, as well as provide rescue services event of a confined space emergency. This 8‐hour program is designed to provide the emergency response team member, who also has rescue responsibilities, with the knowledge and skills necessary to safely perform a rescue from confined spaces using ropes and associated rescue hardware and software. Given a 8‐hour course on confined space operations, students will be able to describe the duties of an operations‐level responder assigned to respond to a confined space incident as outlined in OSHA regulation 29 CFR 1910.146, Permit‐Required Confined Spaces. This course is designed for personnel who will respond to and perform limited entry and rescue operations or support technician level personnel during confined space entry and rescue operations. At the completion of this course, the student shall learn how to protect him/herself, their team and their victims from the hazards within a confined space. Student will learn how to recognize and size up spaces and manage incidents appropriately, using the guidelines defined by NFPA and OSHA. Areas of focus will include environmental considerations, structural concerns, personal protective gear required and safety. Upon completion of this course, the student should have the skills to be able to, identify the characteristics of permit and non‐permit confined spaces, discuss the hazards of confined spaces, list situations that have potential to cause confined space emergencies, identify the key components of a confined space entry program as they pertain to the industry, identify methods by which atmospheric hazards may be identified and monitored during a confined space entry and select the type of personal protective equipment (PPE) needed to safely enter a specified space. Furthermore, if given a scenario involving a confined space emergency, the student should be able to discuss the factors that determine whether entry or non‐entry rescue techniques are appropriate. 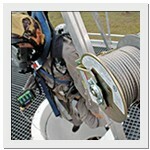 Major subject areas covered include: confined space standards, atmospheric testing, respiratory protection, rope construction and care, rescue knot tying, rope accessory equipment, litter types, lowering systems, hauling systems and patient packaging, victim transport and procedures for using ropes in a high angle environment. The course consists of classroom lecture and practical field exercises with a major emphasis placed upon hands‐on practical exercises.